Off to see the boss for instructions? Moscow, Jul 29 (Prensa Latina) The president of the Palestine National Authority, Mahmmud Abbas, began a three-day visit to Russia on Sunday, aimed at discussing the Levant crisis and the situation in the occupied Arab territories. Abbas gives great importance to his visit to Moscow, whose Foreign Minister Serguei Lavrov talked by phone with the leader of the Islamic Resistance Movement (Hamas), Haled Mashall, about the recent riots in Gaza Strip. 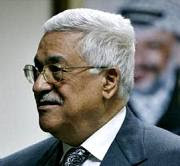 Clashes between Palestinian factions Hamas and Al Fatah forced Abbas to postpone his visit to Russia, initially scheduled for early June, Itar-tass news agency reported. In his telephone conversation with Lavrov, Mashall denied, however, any obstacle that could hinder cooperation between his group and Al Fatah to form a Palestinian State. HAMAS supports the unity of all the Palestinian people, under the leadership of the president of the Palestine National Authority, emphasized the Islamic Resistance leader.